Rummy Circle brings you three days of unlimited fun during the auspicious occasion of Ganesh Chaturthi. 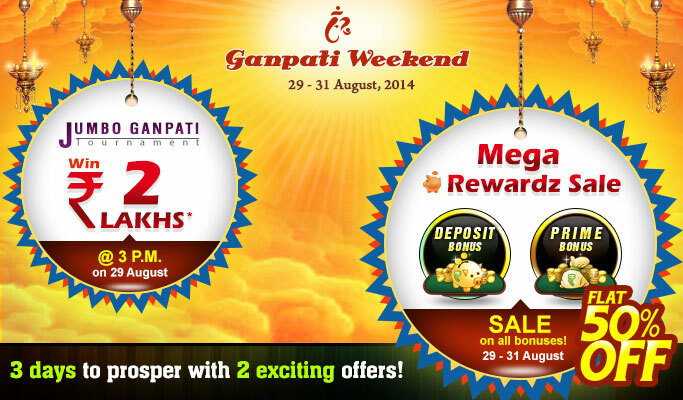 Join the biggest weekend Jumbol Ganapati Tournament and win huge cash prizes and bonuses! The registration for this rummy tournament and mega rewards sale by Rummy Circle has began today, 29th August at 9:00 AM. If you also want to try your fortune in this festival season, register your seats before 2:55 PM today so that you can join the tables on 3:00 PM. The winner will take home cash prizes worth Rs.35,000 from the prize pool of Rs.2 lakhs! Furthermore, claim your mega rewards by Rummy Circle this festival weekend. Get flat 50% off all of your bonuses between 29th of August to 31st of August. That’s you only need to deposit Rs.6000 in order to get Rs.1000 bonus instead of depositing Rs.1000. Claim the biggest bonus in this festival season by Rummy Circle. We hope you have a blessed Ganesh Chaturthi and you will win lots of real cash this weekend. Before joining the rummy tournament, we suggest you to read our review on Rummy Circle. You can post your feedback on the tournament and on the rummy website in the comment section below.